Red Tails Is A very good war drama based on true events. George Lucas known for his adventure and science fiction films tears a page from the WWII war history book and produces Red Tails a true story of courage in the face of adversity and discrimination. Much like Spike Lee's Miracle at St. Anna the backdrop of war becomes the field on which we see the selfless devotion of African-American soldiers helping to maintain a free world. I like the way director Anthony Hemingway tells his story based on true events with a kind heart and forgiving hand, even though the situation was probably more disparaging than he shows here. In 1944 with the war in Europe in full swing setting up air bases in allied countries from which our forces could attack, one base in Italy hosted an all African-American Air Force squadron. Only used to clean up after missions run by white airmen, the group of members from the experimental Tuskegee training program bided their time waiting to get into the ‘real' action instead of shooting at hapless convoys and trains. Torn by their wasted effort, Colonel A.J. Bullard (Terrance Howard) takes his cause to the Pentagon where he pleads his case. The men of Tuskegee in the meantime hustle as many jaunts as they can to keep sharp, some nearly taking fellow pilots lives. Bullard gets an opportunity to pass on a small mission to his Major Emanuelle Stance (Cuba Gooding, Jr.) of escorting a bomber squadron that ends in a successful mission. When the Tuskegee's are requested to lead bombers into a major beach assault, the squadron must face their worst odds yet against superior aircraft the war has never known. The acting in Red Tails proves exceptional with very good character building, discriminating interaction with a dissident group of airmen, a blind eye between ethnic groups involving a romantic affair and realistic drama in the skies. A tip of the hat to a special group of guys who made up the Tuskegee Squadron as they all gave excellent performances. The cinematography using special techniques with CGI is brilliant showing exciting air fights between the German spitfires and American mustangs. The film reminds me of the air war films of days gone by and in my book high time it's brought back to the screen. Close ups of the dogfights are amazing and in one particular scene, had it been in 3D an airplane engine would have been sitting on my lap. The gorgeous Italian coast catches the eye of the camera as a pilot dives toward a German warship showing the contrast between a calm reality and war. The photography gets so lifelike I could feel the fire cloud from the exploding ship. Some may see a downside in the film from the unfavorable light cast upon white air force pilots who brought bigotry and discrimination to the war zone. The issue gets pressed quite heavily here indicating there will probably never be a perfect solution to man's inhumanity to man. In my book the ending shows a realistic apologetic response, one I hope will resonate throughout our communities bringing an end to differences in color, creed and inequality. Red Tails has been rated PG-13 for some sequences of war violence. Get a good seat for all the great flying action and there's plenty of it to enjoy if you are and action lover. 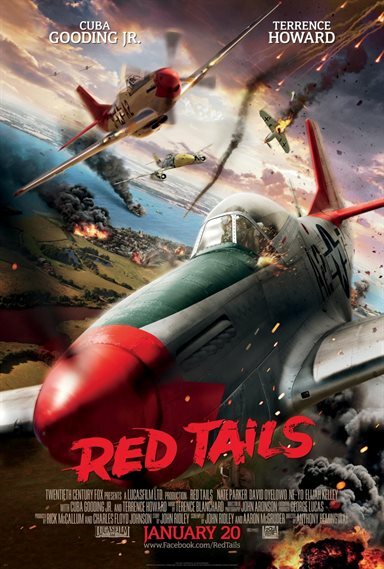 Download Red Tails from the iTunes Store in Digial HD. For more information about Red Tails visit the FlickDirect Movie Database.